Paul Roberts' galvanizing, sweeping social critique of our Impulse Society confronts a world where business shamelessly seeks the fastest reward, regardless of the long-term social costs; where political leaders reflexively choose short-term fixes over broad, sustainable social progress; where individuals feel increasingly exploited by a marketplace obsessed with our private cravings but oblivious to our spiritual well-being or the larger needs of our families and communities. 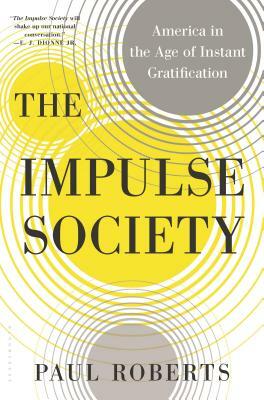 How did the pursuit of short-term self-gratification, once scorned as a sign of personal weakness, became the default principle not only for individuals but for all sectors of our society? Drawing on the latest research in economics, psychology, political philosophy, and business management, Roberts shows how a potent combination of rapidly advancing technologies, corrupted ideologies, and bottom-line business ethics has pushed us across a threshold to an unprecedented state: a virtual merging of the market and the self. And yet, even as our dilemma grows, The Impulse Society finds hopeful signs-not least, a revolt among everyday Americans against the forces of an unchecked market. Inspired by their example, Roberts outlines a way back to a world of real and lasting good. Paul Roberts is the author of The End of Oil and The End of Food. His writing has appeared in the Los Angeles Times, the Washington Post, the New Republic, Newsweek, Rolling Stone, and elsewhere. He was a finalist for a National Magazine Award in 1999 and the New York Public Library Helen Bernstein Book Award in 2005. Roberts appears regularly on TV and radio. He lives in Washington State.